This coming Sunday those of us who follow the liturgical year will likely be observing Baptism of Jesus Sunday. If you’re like me, you will be taking your cues from the reading from Acts 8:14-17, which speaks of the visit of Peter and John to Samaria after Philip (one of the seven) has had great evangelistic success in that region. He’s baptized a number of people “in the name of Jesus,” but apparently this was not accompanied by the outpouring of the Holy Spirit. Instead the Spirit waited until Peter and John made their way to Samaria and laid their hands on the people and imparted the Spirit. Something happened, though as to what happened isn’t described, as Simon (known as Magus) offered to pay Peter and John so he could do what they were doing. Unfortunately for Simon, the two Apostles rebuked him. Such things are not for sale (this is where we get the term “simony”). I don’t think Paul is against baptism. I don’t think he downplayed it. But he also wasn’t willing to divide over it. Remember that in Acts 8, Philip baptizes in the name of Jesus (as an alternative to Matthew’s formula of Father, Son, and Holy Spirit, suggesting that there was more than one formula in the early church, so no need to divide over that!). Well, Paul asks whether anyone was baptized in Paul’s name? Of course not. Nor was Paul crucified for them (or us). Paul admits to baptizing a few early converts—Crispus, Gaius, and the household of Stephanas, though he doesn’t name Sosthenes, who was an early convert and leader (see Acts 18). What I find interesting here is Paul’s statement that “Christ did not send me to baptize but to proclaim the gospel, and not with eloquent wisdom, so that the cross of Christ might not be emptied of its power” (1 Cor. 1:17). Now Peter invited converts in Acts 2 to be baptized, so that they would receive forgiveness of sins and the gift of the Holy Spirit (Acts 2:38). Philip baptized the Samaritans and the Ethiopian. Paul would later rebaptize a group of believers who had received only the baptism of John, and then as Peter and John did in Acts 8, he laid hands on them and they received the Holy Spirit (Acts 19). Yet, here he seems to down play baptism. I was baptized as an infant and later as a teen. In between I was Confirmed in the Episcopal Church. For many years I struggled with the question of baptism. I’m still a proponent of believer’s baptism and haven’t reached the point where I could baptize an infant (one of the reasons I chose not to pursue ministry in the Evangelical Covenant Church during my seminary years). I will also note that one of the issues that got me fired as a theology professor was my apparent laxity when it came to baptism (I believe it was a misunderstanding of my position by a student who had interviewed with a trustee who believed that immersion was required for salvation, but needless to say I am a casualty of our baptism wars). So, as we approach Baptism of Jesus Sunday, what is the purpose of Baptism? What is your definition? Who is the proper candidate? Biblically, I still see little wiggle room for anything other than believer’s baptism, but many others disagree. Scot McKnight has added a new book arguing for the biblical basis of infant baptism (It Takes a Church to Baptize, Brazos, 2018). I’m not convinced, but Scot, who is a New Testament scholar, has moved from a believer’s baptism position to whole-heartedly support infant baptism. Could I be wrong? I may not be baptizing infants, but I recognize the validity of such forms (we practice Open Membership among the Disciples of Christ—my denomination). At the same time, we might want to remember that people have died for their position on baptism—consider the fate of many Anabaptists of the sixteenth and seventeenth centuries. As for Paul, he came not to baptize but to preach Christ, and him crucified! Nothing, in Paul’s mind, should get in the way of this. Not baptism, not eloquence. Just Christ crucified, which he suggests was a scandal to Jews and foolishness to Gentiles. How does that message fit with Baptism of Jesus Sunday? 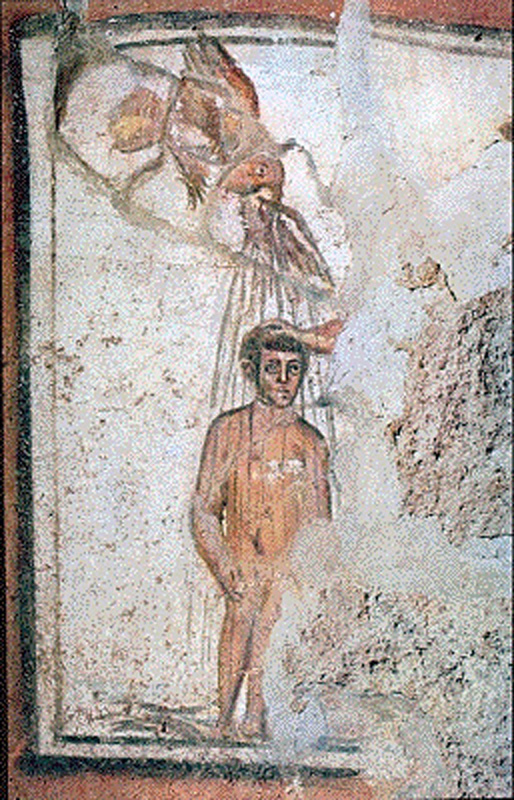 Picture attribution: Baptism - Catacomb of Peter and Marcellinus, from Art in the Christian Tradition, a project of the Vanderbilt Divinity Library, Nashville, TN. http://diglib.library.vanderbilt.edu/act-imagelink.pl?RC=49948 [retrieved January 8, 2019]. Original source: www.yorckproject.de.